'Old King Cole's Treasure Hunt' was a radio play in seven 15-minute episodes specially recorded for Washacre FM by the Westhoughton Methodist Amateur Dramatic Society. The script was adapted from the Westhoughton Methodist ADS pantomime performed in 2011. The show is suitable for listeners of all ages, but especially the young-at-heart. Old King Cole was a merry old soul. At least he was merry, but not any more. Things are not well in the Kingdom of Cole, mainly due to Old King Cole's lack of cash, and even worse running out of coal. Not only is he cold but he has to put up with even more complaints from Queen Cheryl than usual. However, Old King Cole's fortunes are about to change. 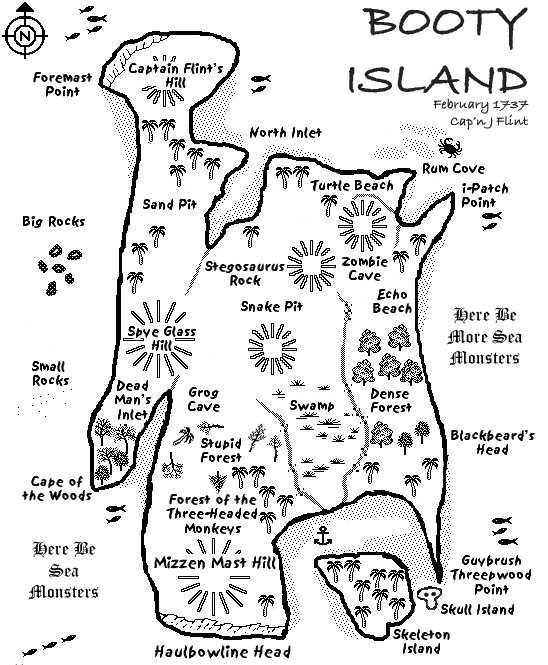 Jimlad, a happy-go-lucky adventurer, is searching for treasure. First though, he has to solve the clues to find the pieces of his Treasure Map before setting sail to find the treasure itself. Old King Cole is more than happy to join the Treasure Hunt, despite the Queen's misgivings. As well as a ship, Old King Cole will need a crew. What about a cordon bleu cook? Who better than the Keaw Yed Cookery Queen herself, plus her faithful assistant, to throw together something deliciously unhealthy? It sounds like a nurse and a doctor will come in handy such as the glamourous Nurse Gladys and Doctor Foster, although he does have an aversion to water. Above all a gallant captain is required, preferably one who is indestructible, and Captain Scarlet is certainly skilled with a sword. But all may not be plain sailing for Old King Cole. There may be other people who would like to get their hot, sticky hands on the treasure. Why should Blind Pew volunteer his services as the navigator? Are his shipmates, Pegnose Pete and Red Rackham, the honest seafarers they claim to be? How many more bizarre things does Mary Mary Quite Contrary need for her contrary garden? What is the significance of the rock shaped like a dinosaur? Are there penguins in the Caribbean? Old King Cole is about to find out. At times he might wish he was somewhere else, anywhere else! But once you start a Treasure Hunt you can't stop until you find the Treasure. Old King Cole's Treasure Hunt is loosely based on the poetry associated with Coel Hen, the original Old King Cole, who is thought to have ruled South West Scotland, Cumbria and Yorkshire from about 350 AD to 420 AD. Coel Hen may, or may not, have gone on a Treasure Hunt. 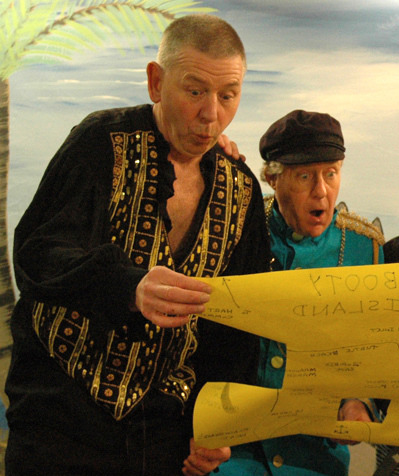 Old King Cole's Treasure Hunt is a fast moving story containing scenes of mild peril involving challenging clues, glittering gold, gourmet cuisine, black coal, wicked pirates and traditional pantomime-style jokes. No snakes, penguins or parrots have been harmed as part of this production which is in Real 3D Surround-Sound. 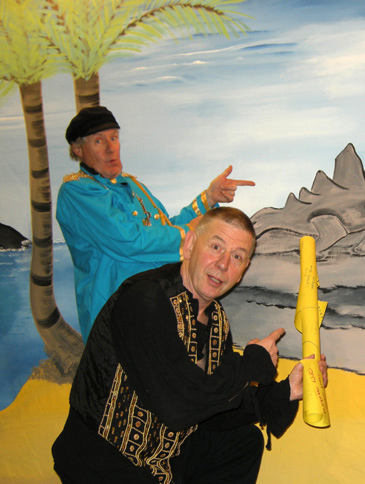 'Old King Cole's Treasure Hunt' is suitable for all ages. 'Old King Cole's Treasure Hunt' was on air every day from Monday 16th to Saturday 21st June 2014 during the Washacre FM 'Schools Hour' and between between 12pm and 1pm on Sunday 22nd June. Westhoughton Methodist Amateur Dramatic Society meet and perform at the Westhoughton Methodist Church Hall, Wigan Road, Westhoughton, BL5 3RQ. Rehearsal nights are Mondays from 7:30pm until 10pm. New Members are welcome. As is anyone wishing to join our backstage crew to help with such items as: publicity, ticket sales, sound effects, scene changes, costumes or props. 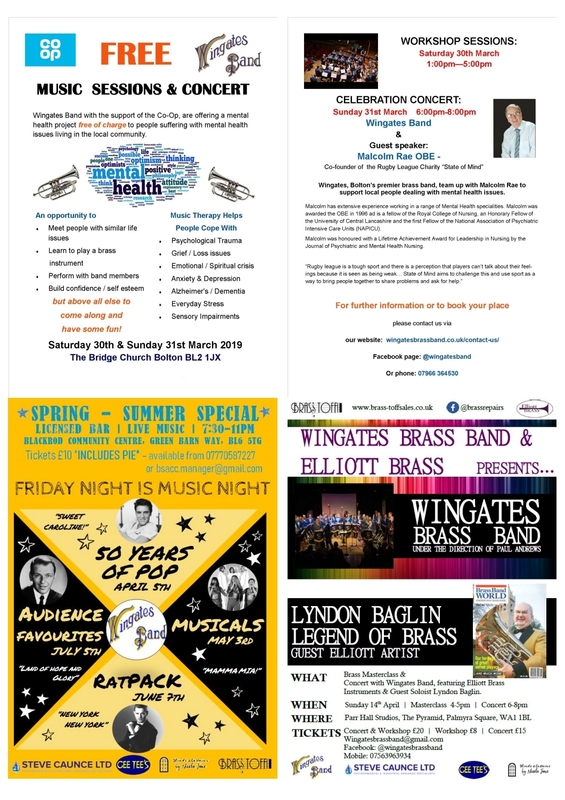 We put on three productions each year; a Pantomime, a Comedy Play and a Murder Mystery Evening, plus this year for the first time, a Radio Play. 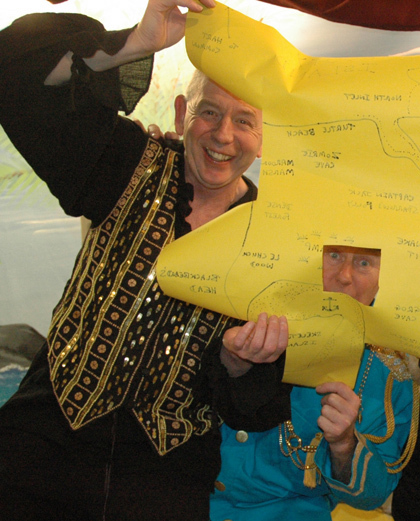 We write the scripts for all our Pantomimes, which enables us to take traditional stories, give them a local flavour and make sure they are suitable for all ages. Rehearsals will start for our next Pantomime in early November. It is now thirty five years since our first production, the One-Act Play "April Dawn". Our first Pantomime, "Aladdin", was two years later in 1981 and in February this year "Puss in Boots" was our 33rd Pantomime. In May we performed the comedy play "The Farndale Avenue Housing Estate Townswomen's Guild Dramatic Society Murder Mystery" by David McGillivray & Walter Zerlin Jnr.